Giglio Island, or Isola del Giglio is an Italian island in the Tyrrhenian Sea, just off the coast of Tuscany. It is situated west of the Argentario promontory, approximately fourteen kilometres away. The island has a small population of 1,600 and 28 kilometres of glorious sandy beaches. This tiny, mountainous island doesn't have an airport so the only way to reach Giglio is by ferry. 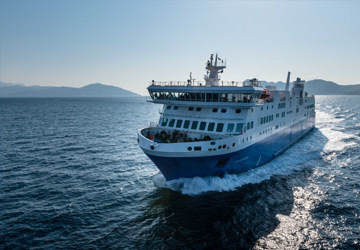 The journey from Porto Santo Stefano, on the Italian mainland to Giglio port takes approximately an hour with a frequency of up to 4 crossings daily. Buses run between the three main towns on the island throughout the year and are more frequent in the summer. Boats can be hired from Giglio Porto, or visitors can take a Taxi Boat, or hire a boat with a driver in order to take a trip around the island. The rich history of the island is still accessible to the contemporary visitor through buildings such as the Roman Villa ruins, excavated in 1918, in Giglio Porto, or the old Saracen Tower built in 1596 by Ferdinand de Medici. Right in the centre of the island sits Giglio Castello which is a medieval hilltop village completely encircled by high fortress walls with seven of its original ten towers still intact. This imposing fortress was originally built in the twelfth century by the Pisans, and was then restored and reinforced by Ferdinand II de Medici in 1623. The parish church of San Pietro is located inside the fortress walls and it contains frescos and relics dating back to the fourteenth century. 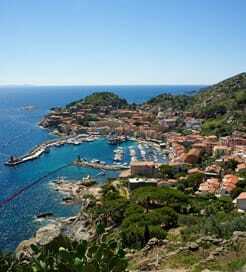 Giglio Island offers a wealth of delights to holiday-makers. There are many golden beaches for sunbathing and a network of footpaths for the more adventurous seeking breath-taking views. Each of the three main towns, Giglio Porto, Giglio Castello, and Giglio Campese cater for different appetites, but delicious Tuscan cuisine, fresh fish and seafood is in plentiful supply; those wishing to sample the local wines can do so in the old wine cellars of the Fortress. Should you wish for a more active itinerary you could go horse-riding, swimming, or snorkelling in the crystal clear waters. Lessons in diving, canoeing and windsurfing are also available. For more information, please visit our Ferries from Italy to Giglio Island page.